For Frequently Asked Questions about the Mass Lottery's New England Patriots Instant Tickets, please click on the corresponding ticket below. Q: How do I update personal information that I submitted when I registered for the 5X CHAMPIONS New England Patriots Instant Ticket Second Chance Drawing? A: Go to www.patriotsmasslottery.com and log in with the e-mail address and password that are associated with your account. Then go to "My Account" to make changes to your personal information. Click on "UPDATE" when you're finished. Don't create another account. Having more than one account is a violation of the 5X CHAMPIONS New England Patriots Instant Ticket Terms and can get you removed from the membership. Q: Can I change the e-mail address that I use to log in? A: Yes. Log in using your old e-mail address and password. Then go to "My Account" and change the e-mail address where indicated. Click on "UPDATE" when you're finished. A: Go to www.patriotsmasslottery.com and click where it says "Forgot your Password?" and follow the on-screen instructions from there. Q: What should I do if I encounter a problem with the 5X CHAMPIONS New England Patriots Instant Ticket website? A: Click on the "Feedback" page to submit your question or problem. We will assist you via return e-mail. The more details you can provide about your problem, the better chance we will have of quickly resolving the problem. Q: What tickets are eligible for the 5X CHAMPIONS New England Patriots Instant Ticket Second Chance Drawings? A: All non-winning Massachusetts Lottery $5 5X CHAMPIONS New England Patriots (Game 158) Instant Tickets that you purchased during the sales period of the game. One ticket is required per entry. Q: How do I enter my non-winning tickets? A: Go to https://www.patriotsmasslottery.com/ and create a player account (if you don't already have one), then log in with the e-mail address and password associated with your account. Once logged in, click on the 5X CHAMPIONS New England Patriots Second Chance Drawing link and then on the "Submit Entry" page to enter your non-winning $5 5X CHAMPIONS New England Patriots Instant Tickets per the entry instructions. Q: Can I mail in my entries? A: No, all entries must be entered in online through the Patriotsmasslottery.com website. Q: Can I enter a drawing more than one time? A: Yes, you may enter a drawing as many times as you wish. Each entry requires the use of one not previously submitted non-winning $5 5X CHAMPIONS New England Patriots Instant Ticket. Q: What happens if I submit my entry after the deadline for a drawing? A: Entries received after the deadline for a drawing will be included in the next drawing. Entries received after the deadline for the final drawing will not be eligible for any Second Chance Drawing. Q: What happens to the entries that do not get picked in a drawing? Are they retained for future drawings? A: No. Only entries submitted during the entry period for one of the drawings are eligible for that one drawing. A: A record of your entries appears on the bottom of your entry page. If you see the entry there, you can be assured that it is in the system and has been accepted for the next drawing. Q: Can I throw away my tickets after they've been submitted into the 2014 New England Patriots Second Chance Drawings? A: Yes, you may dispose of tickets after verifying that your entry has been submitted. Q: How do I find out if I have been selected as a winner? A: Winners are notified by the Lottery. Following the verification of winners in each drawing, you can view the winners' names and hometowns on patriotsmasslottery.com website by clicking on "Drawing Winners" link on the left side of each ticket page. 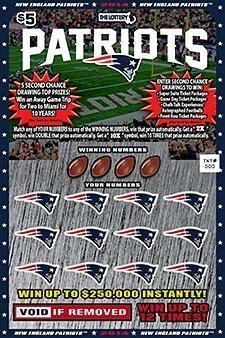 Q: What are my odds of winning a prize in the 5X CHAMPIONS New England Patriots Instant Ticket Second Chance Drawings? A: Odds of winning any prize in any Second Chance Drawing will vary depending on the number of entries received for that drawing. Q: How do I update personal information that I submitted when I registered for the 2014 New England Patriots Instant Ticket Second Chance Drawing? A: Go to www.patriotsmasslottery.com and log in with the e-mail address and password that are associated with your account. Then go to "My Account" to make changes to your personal information. Click on "UPDATE" when you're finished. Don't create another account. Having more than one account is a violation of the 2014 New England Patriots Instant Ticket Terms and can get you removed from the membership. Q: What should I do if I encounter a problem with the 2014 New England Patriots Instant Ticket website? Q: What tickets are eligible for the 2014 New England Patriots Instant Ticket Second Chance Drawings? A: All non-winning Massachusetts Lottery $5 2014 New England Patriots (Game 97) Instant Tickets that you purchased during the sales period of the game. One ticket is required per entry. A: Go to https://www.patriotsmasslottery.com/ and create a player account (if you don't already have one), then log in with the e-mail address and password associated with your account. Once logged in, click on the 2014 New England Patriots Second Chance Drawing link and then on the "Submit Entry" page to enter your non-winning $5 2014 New England Patriots Instant Tickets per the entry instructions. A: Yes. You can mail your non-winning $5 2014 New England Patriots Instant Ticket to: 2014 New England Patriots Second Chance Drawing P.O. Box 222, South Walpole, MA 02071. Only one entry (one non-winning MA Lottery 2014 New England Patriots Instant Ticket) per envelope. Each envelope must be no larger than 4 1/2 by 9 1/2. A: Yes, you may enter a drawing as many times as you wish. Each entry requires the use of one not previously submitted non-winning $5 2014 New England Patriots Instant Ticket. Q: What are my odds of winning a prize in the 2014 New England Patriots Instant Ticket Second Chance Drawings?